Firstly, let me emphasize that no rabbits are killed to produce wool. Like any other wool producing animal, the well being of the rabbit is of vital importance to produce top quality wool – they are very well cared for. Wool must be harvested for their wellbeing, and the process depends on the breed. The German Angora has a constantly growing coat, and must be clipped as the coat reaches a “workable” length (much like a maltese poodle). The English and French Angora, has a natural moult cycle, every three to four months, and the loose fibres are plucked or stripped from the rabbit, much as the hair of a pet dog is removed when it comes loose. 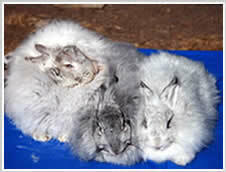 Plucking a German Angora would be cruel, as the wool would be pulled out at the roots, whereas clipping the French and English would leave behind some of the moulted roots, and cause massive matting of the coat – so it is important to know which breed you are working with and treat it accordingly. 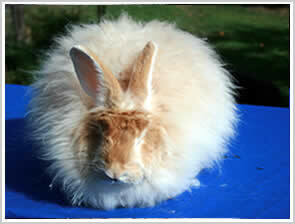 As we have specialised in the English Angora, our rabbits all have to be plucked. 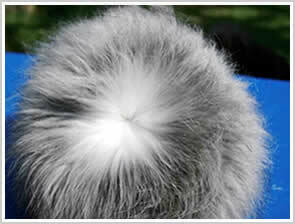 The English has been bred to moult every four months. This means that the hair reaches an optimum length of about 10cm – 14cm in this period, and proceeds to loosen from the follicle. At the same time it is being replaced by secondary growth. This secondary growth will be about 1 – 2cm long when the loose coat is removed. Only the long loose fibre is removed, and any wool that is still attached to the hair follicle is left behind. It may take two sessions to remove all the wool, as the back and shoulders tend to release before the hips and throat. The wool under the belly, and on the feet and legs is only clipped when necessary and discarded as it is too short to be used. Plucking produced the best quality, prime fibre, giving top garments and wool, with no fly--aways. Plucking must always be done by trained personnel to prevent the rabbit being over plucked and the short fibres also being removed. The rabbit will release its hair once it is being plucked, but any short fibre mixed with the long will compromise the quality of the finished product. 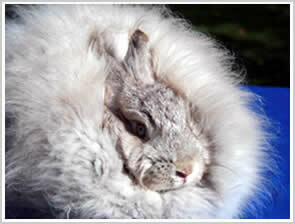 If the rabbit is not in moult, this will also injure it and damage its skin. 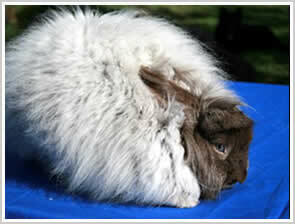 Retaining the short new coat means that the rabbit suffers very little, if any, temperature shock when harvested. Should a rabbit in moult be clipped instead of plucked, you will remove the tips of the new coat, thereby having little short pieces of fibre that cannot be twisted into the wool at spinning. These fly off the finished garment, and stick to everything creating a mess and giving Angora a name for being an inferior, shedding wool. As rabbits are such clean animals, there is no further preparation to the wool before spinning. We handspin all the wool, ply and mothproof, prior to using for our exclusive garments. The processing of spinning twists the fibres, creating a biased thread. Two or more of these threads are then spun in reverse, to untwist the fibre, while wrapping the two threads around each other to create a balanced yarn. 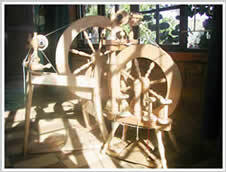 It takes about 10 days to spin 1 kilogram of wool, which must then still be plied and mothproofed. From harvesting till the wool is used takes about 2 weeks per kilogram, 150g of wool will make a scarf, 700g a standard size jersey. Once a garment has been made, depending on the process used, it will have had its first wash before it goes out. 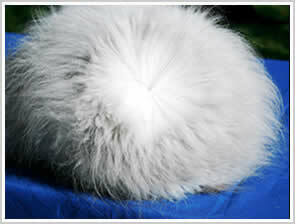 The simplest way to store your angora item is in a sealed packet in the freezer. This will prevent any chance of it being attacked by clothes moths, whilst ensuring that you do not have to air it out to get rid of the “moth balls” smell. As far as cleaning is concerned, unless it has had a foreign matter spilled on it, an airing in the breeze will normally shake any loose dust off it.